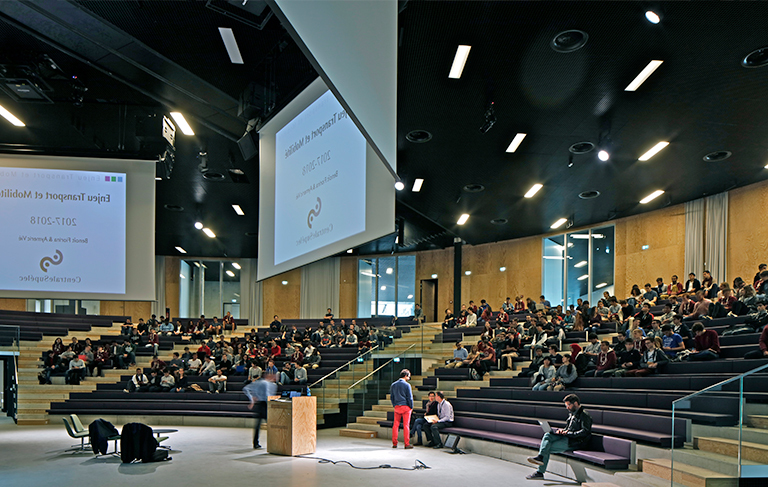 Born in 2015 out of the merger between two leading French engineering schools – Supélec and the Paris École Centrale – CentraleSupélec recently inaugurated its third campus: Completing its first scholar year, the new Paris-Saclay campus joins the existing ones in Rennes and Metz, offering more learning opportunities to a total of 4,200 students . Situated on the outskirts of South West Paris, this new, architecturally ambitious campus is the result of a six year consultation and piece of work, driving towards the goal of facilitating exchanges and interactions between all stakeholders via wide open spaces that represent the university’s value of knowledge sharing. For almost two centuries, CentraleSupélec's top engineers have been using their skills and knowledge to support the development of corporate institutions and public organisations. Located in the Yvelines region, the new CentraleSupélec campus comprises two separate buildings: with a surface of over 25,000sqm, the Francis Bouygues building was financed by a public/private partnership, while the 48,000sqm Gustave Eiffel building was funded by the French State. Architectural firm OMA imagined the Eiffel building with a wide diagonal around which open and shared spaces are arranged. With glass ceilings and partitions, the building brings the outside in and benefits from plenty of natural light. In order to offer an environment favouring knowledge and training to the next generation of engineers, the school trusted French scenography agency dUCKS scéno, who worked closely with AV solutions integrator Tech-Audio. During the call for tender, the integrator stood out from the competition by submitting a project that was both financially and technically relevant, offering modern and sustainable solutions comprising of a full network of projectors that would respect OMA’s architectural concept while providing efficiency and reliability. 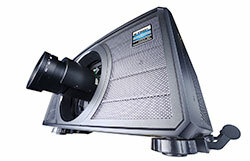 For the main auditoriums and lecture halls, which are used for lectures and classes and various events including graduation ceremonies, conferences and shows, the integrator specified laser projectors from British manufacturer Digital Projection. Amélie Chasseriaux, project manager at dUCKS scéno, explains: "This architectural project integrates floor-to-ceiling windows overlooking the atrium which spreads across all amphitheatres. It was therefore critical to be able to benefit from powerful projectors capable of delivering enough brightness for students to be able to clearly see the content while taking notes in broad daylight, without having to resort to black-out curtains." 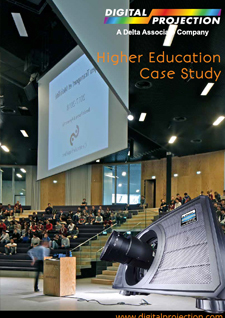 A total of 12 Digital Projection laser projectors were deployed within the Gustave Eiffel building: seven E-Vision Laser 6500 projectors are installed in the “smaller” 50 to 120 seater auditorium, while an E-Vision Laser 8500 ensures visual content for the 120 seat theatre. 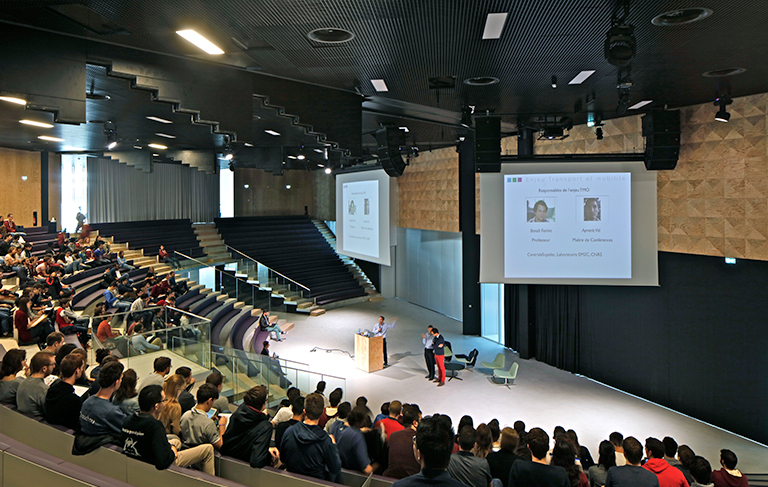 Two further M-Vision Laser projectors cater for the school catering area, while three E-Vision Laser 8500's were specified for the Grand Hémicycle, the largest lecture hall which seats 960 students. This particular lecture hall was designed as a modular space, and as such it can be split into three different parts thanks to folding partitions hosted in the ceiling. Live content management and layout are handled courtesy of an Analog Way Ascender video processor for the various room configurations. Extron switching matrices and DTP / HDMI converters were installed upstream, and all control rooms are connected by fibre bypasses to allow for live events transmissions from and to the main areas of the building. Séverine Zaepffel, project manager at Tech-Audio, comments: "One of the main criteria for the specifications was maintenance. Here, the Digital Projection projectors are used on a daily basis, both for the school curriculum as well as the adjacent activities. We knew laser technology would help to dramatically reduce maintenance costs by removing the need for lamp replacement, so we immediately turned to Digital Projection, the pioneer in high-brightness laser projection technology. " It was important for all stakeholders to respect the architectural work from OMA as well as the Ducks scéno concept. Working together, all the different companies involved achieved this goal, without any concessions on functionalities, or shortcuts on maintenance: "The main lecture hall was without any doubt the most complex in terms of integration," concedes Amélie Chasseriaux. 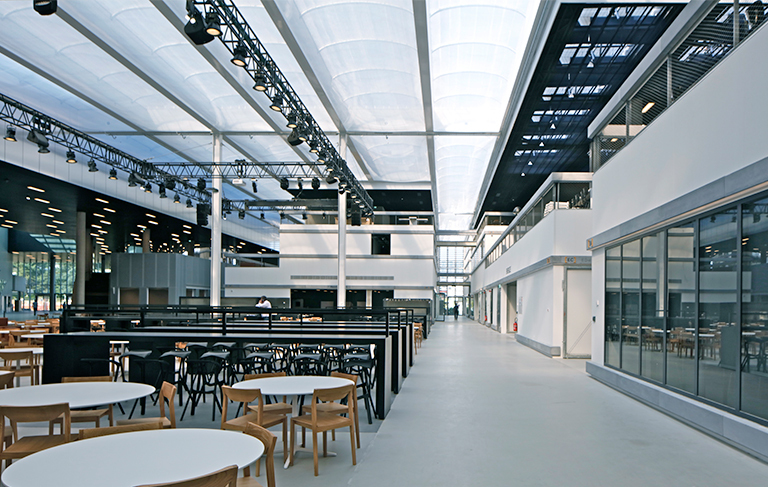 "It was simply impossible to install the projectors in the back of the atrium because of the height of the ceiling and the fact that there was no control room. We also had to follow the room requirements in terms of aesthetics and practical performance regardless of the configuration, with open or closed partitions. In order to minimize the visual impact of the projectors, we opted for a rear projection configuration using 0.38:1 ultra-short throw lenses. " The screens and projectors are rigged under winches and pantographs, and can be hidden in the ceiling when the room is used. When content projection is required, all three screens along with the three projectors automatically come down from the ceiling to reach their position. Students have been benefiting from the AV equipment since the beginning of the academic year, taking ownership quickly. All lectures and courses can be recorded and made available on the school's educational platform, thanks to a fully automated video editing system.